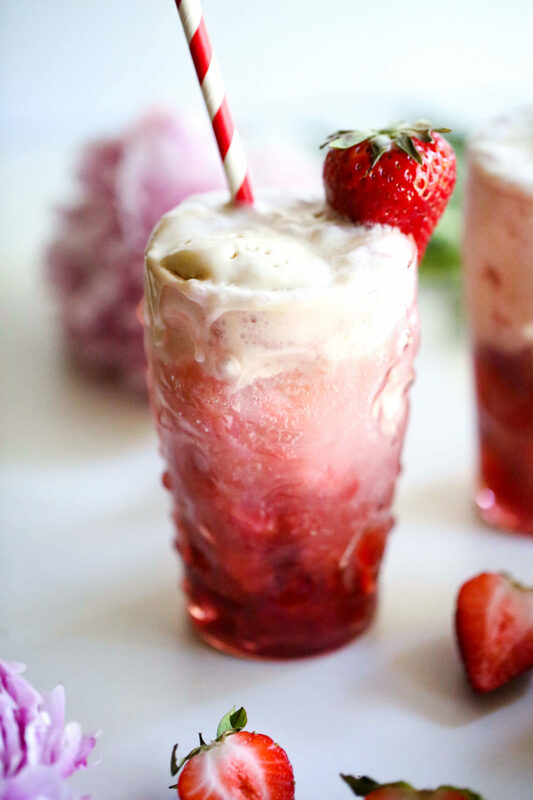 I’ve teamed up with my friends over at California Strawberries again to bring you a healthier take on a classic ice cream float. Instead of traditional soda and Ice Cream, I made my own strawberry soda by adding a simple homemade strawberry syrup made with fresh California Strawberries and unrefined sugar! I then topped it with mineral water and dairy free vanilla Ice Cream. 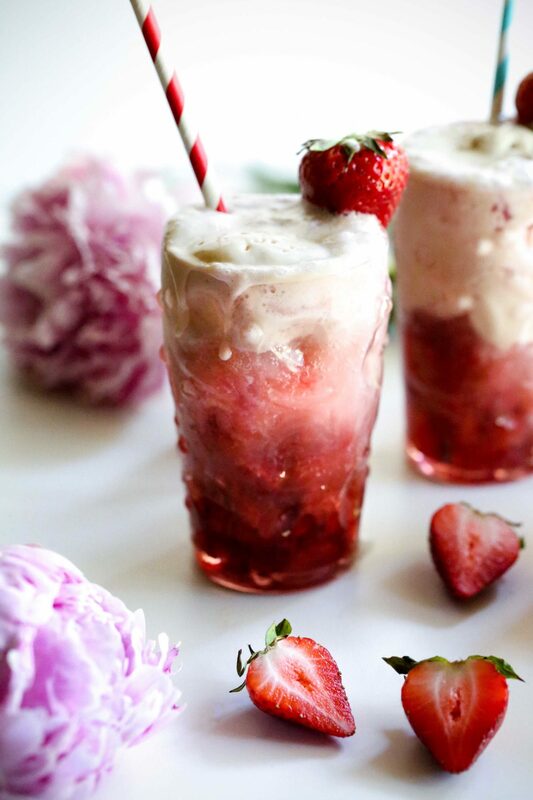 You can choose to keep the strawberry syrup kind of chunky so you get yummy bits as you scoop them up with your Ice Cream or puree it so it’s easier to drink through a straw, I’ll leave that one up to you! I love that this recipe is healthier, paleo and vegan friendly, easy to prepare and tastes great too! Did you know that strawberries are low in sugar, score, with just 50 calories per one cup serving? And they are packed with beneficial antioxidants and vitamin c, so I try to get in my serving of 8 strawberries a day. 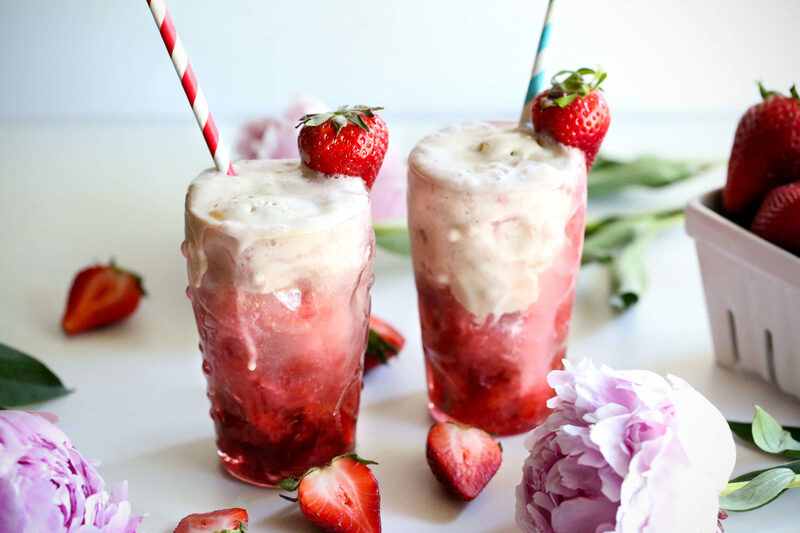 Plus, strawberries just scream summertime and are the perfect snack, you’ll want to make this float all summer long! Pinky promise with ice cream and a strawberry on top! In a medium saucepan bring strawberries, honey/maple syrup and water to a boil over medium heat. Mash strawberries as they cook to break them down & release more juices. Once boiling reduce to medium-low heat and cook for an additional 8 mins. Remove from heat and let cool. Add to a bowl, cover and refrigerate for a few hours. Divide strawberry syrup mixture between 2 tall glasses. Pour in equal amounts of sparkling water and stir to combine. Top each with a scoop of dairy free vanilla ice cream, serve immediately with a straw & spoon. Drinks like this remind me of our honeymoon to the Caribbean. We took a cruise starting in Puerto Rico and visited places like St. Lucia, Antigua, Barbados and St. Thomas. Although I wish we could’ve spent a whole week on our fave island, St. Lucia! Sipping on drinks like this have me planning out a whole new trip there in my head, even if it’s just a pipe dream. But really, please take me back!! I want to hike the Piton mountains this time, do more snorkeling and spend most days lying on the beach sipping drinks like this (even if they don’t have any rum in them lol!) 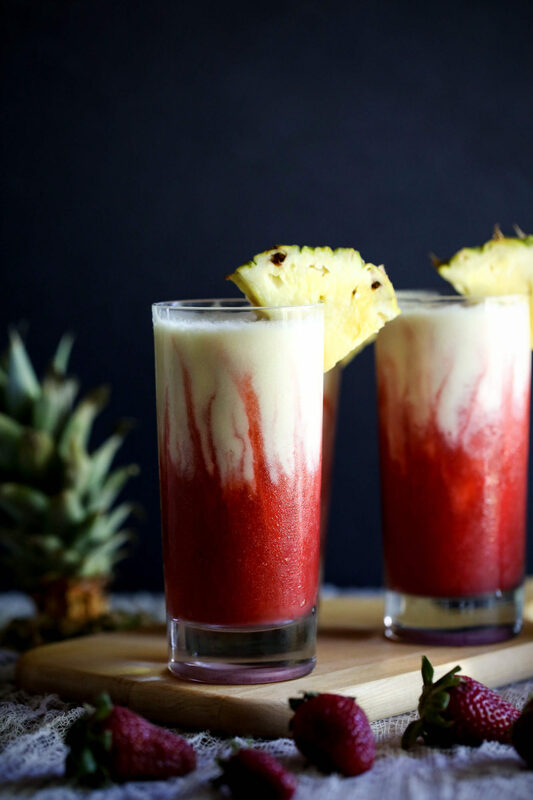 I made this mocktail version of a lava flow but added in some gut healing and skin boosting collagen. It helps with all the things alcohol doesn’t making it a healthier but “this still tastes naughty” option. I’ll turn a blind eye if you want to make it into a cocktail though, haha! This drink also contains some healthy fats and it’s dairy free and refined sugar free! I created it with my friends over at Vitacost! I want to give them a huge hug every time I get my delivery! They make my life so much easier by keeping my pantry stocked full of healthier products like the collagen and coconut cream used in these drinks and I don’t even have to get out of my pj’s to shop! 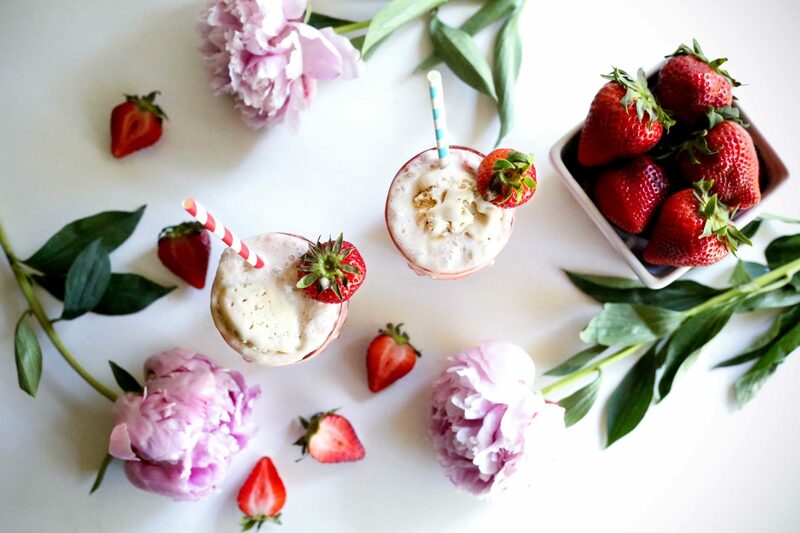 Cheers to healthy summer drinks and to shopping in your PJ’s! Add frozen strawberries, 2 tbsp maple syrup, filtered water, pinch of salt and a squeeze of lemon juice to a high speed blender and purée. Transfer the strawberry mix to a large measuring cup/bowl and set aside. Clean out your blender and add in pineapple, blend until liquified and add in coconut cream,1 tbsp maple syrup, collagen pepetides, pinch of salt, a squeeze of lemon juice and ice. Blend until slushy. 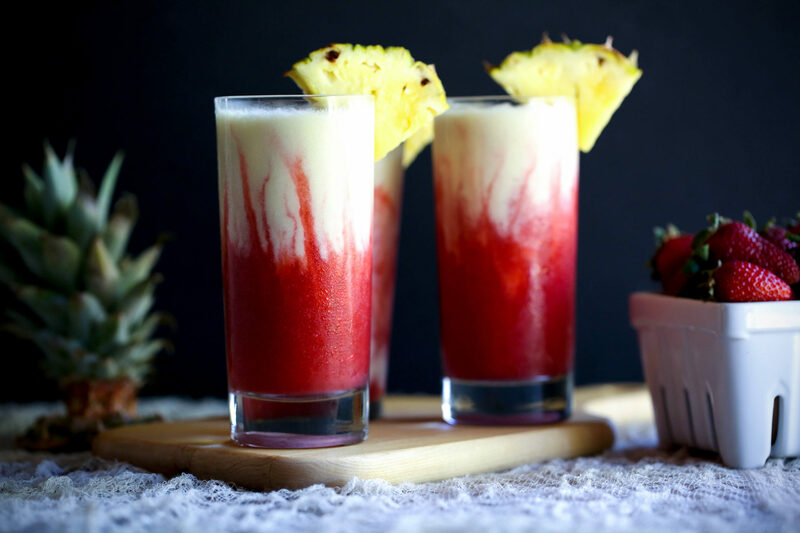 Fill your cups equally with the strawberry mixture, slowly pour the pineapple mixture on top. Slide a chopstick carefully up the sides of the cup to create a fun lava flow effect. Garnish with pineapple wedges and serve. This recipe really reminds me of my grandfather. For those of you that don’t know, my grandfather and father owned bakeries up and down the California coast. Baking runs in my blood, but even though I don’t bake exactly like I used to or eat cookies all the time (like I used to) it’s nice to know I can have an occasional treat that brings back many fond memories. Homemade cookies always bring back memories, it was one of the things he always had in surplus inside cookie jars strewn throughout the kitchen. 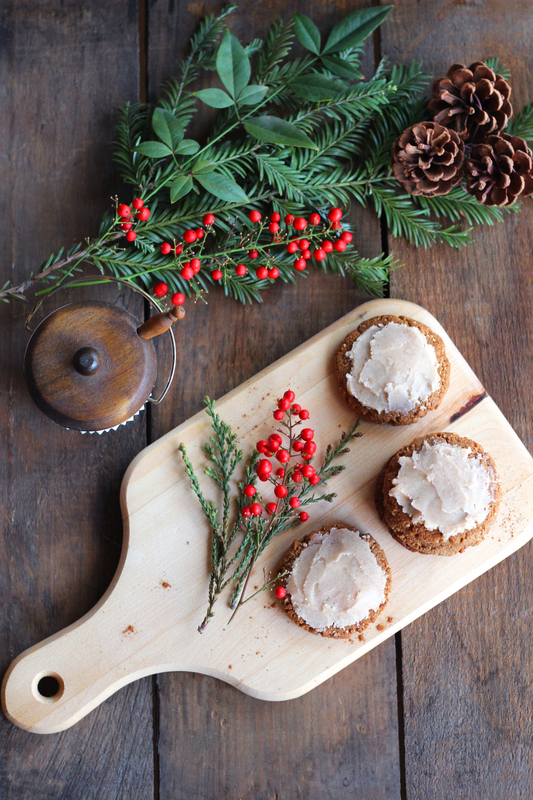 Especially this time of year, we ALWAYS had a cookie (or 3) in our hand! My grandfather passed away 7 years ago on the same day my husband suffered a stroke, a story I will leave for another time. But, shortly after he passed we moved into his home, and we haven’t left. I still feel him here, watching over us, it’s a comforting feeling. I feel like he’s still teaching me. Whenever I have an ah ha moment with paleo baking, I feel like he has something to do with it ;) I used to bake in the same kitchen along side my grandfather and I have many many good food memories in this kitchen. 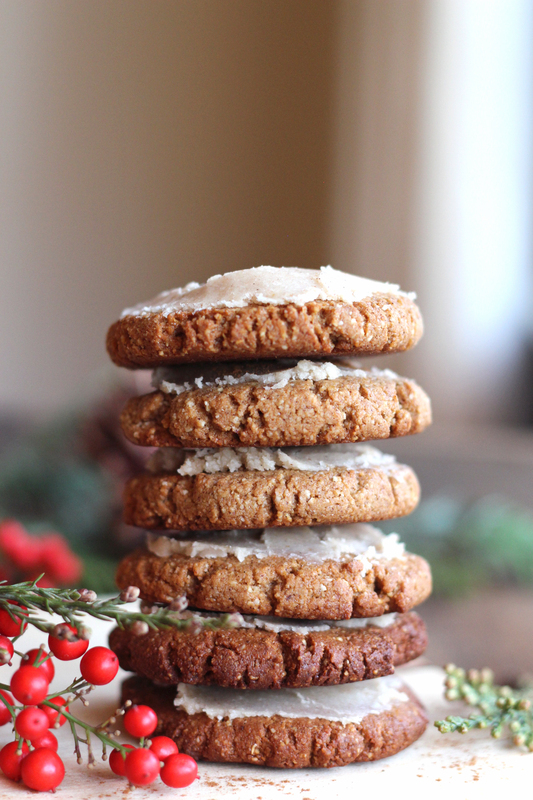 Every time I make these cookies I feel as if he is standing behind me, proud to know that in some way I am carrying on the family tradition of baking and sharing recipes. He was always sharing recipes with others. 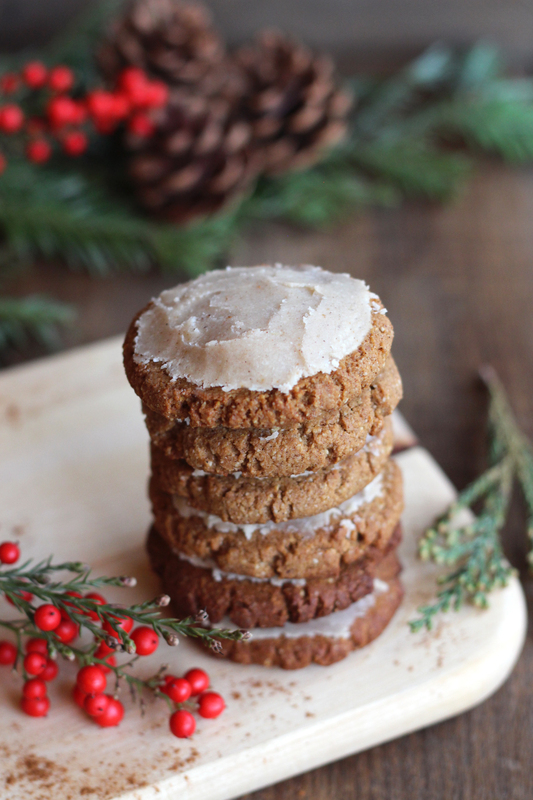 These cookies really taste like the real deal, you almost forget that they are paleo friendly. So i’m sharing this recipe with you, in hopes that it brings back some fond memories for you too. Memories of when life was a little more carefree. When you could have a cookie and just celebrate without worrying about what’s in it. Happy holidays to you and yours! In a medium bowl mix together almond flour, cashew flour, coconut flour, coconut sugar, spices, zest, salt and baking soda until combined. In a small bowl mix together melted coconut butter and oil (cooled), egg, vanilla extract, lemon juice, honey and whisk together. Pour wet ingredients into the dry ingredients and mix until incorporated. Roll dough into equal sizes (about 1 inch in diameter) with your hands and place onto lined cookie sheet. Flatten each cookie to about ¼ inch thickness (if you like your cookie crispy flatten to 1/8 inch) with the palm of your hand or the bottom of a flat cup (greased). Place in the oven for 10-15 mins. or until the center of the cookies are no longer completely soft. Keep an eye on them so they don’t burn. Let cool on a wire rack before icing. 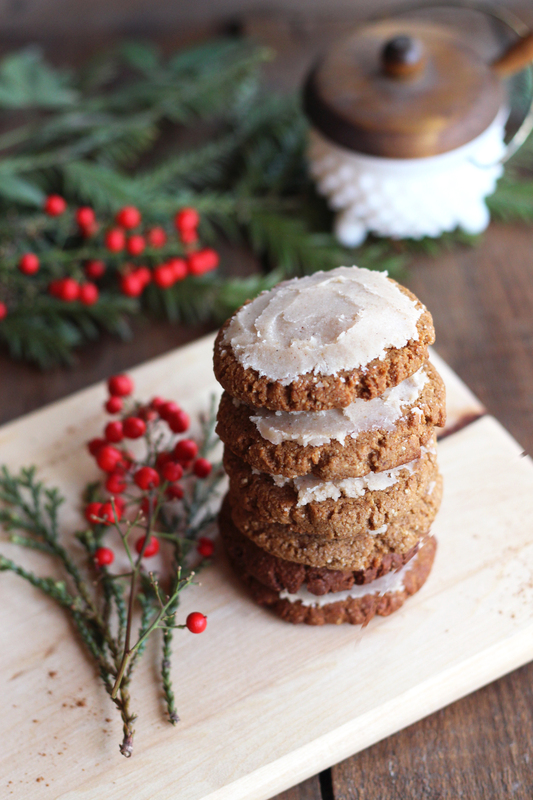 When cookies have cooled, slather with icing. 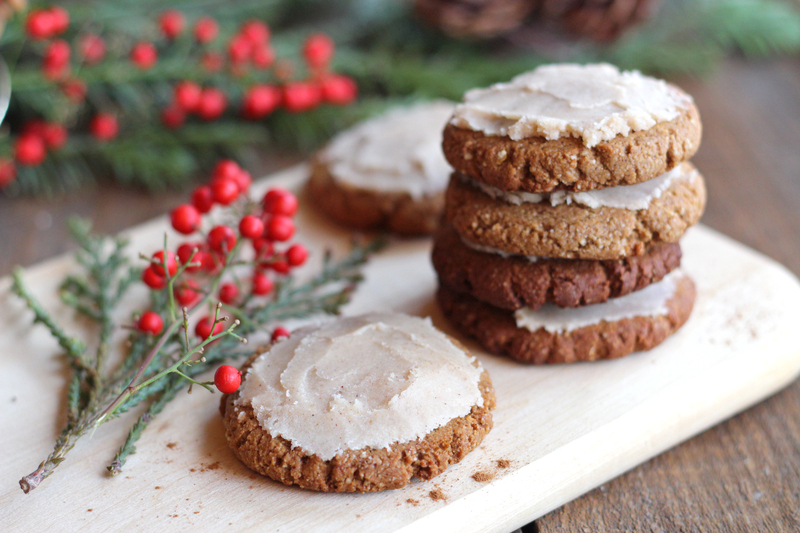 If icing is still too wet, place iced cookies into fridge until the icing hardens. 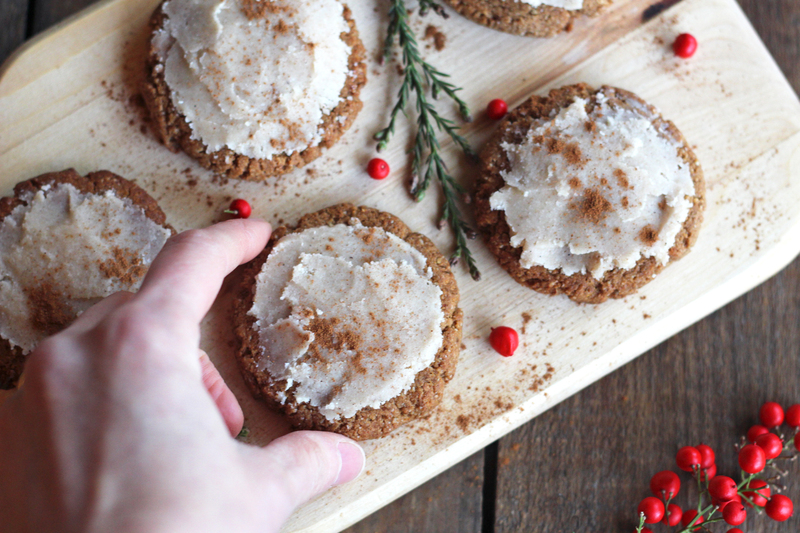 Sprinkle the top of iced cookies with cinnamon, if desired, and enjoy! Place bowl in the fridge for a few mins. to harden up into a spreadable icing consistency.